It’s only fitting Netflix’s new interactive series is launching with an interactive trailer. 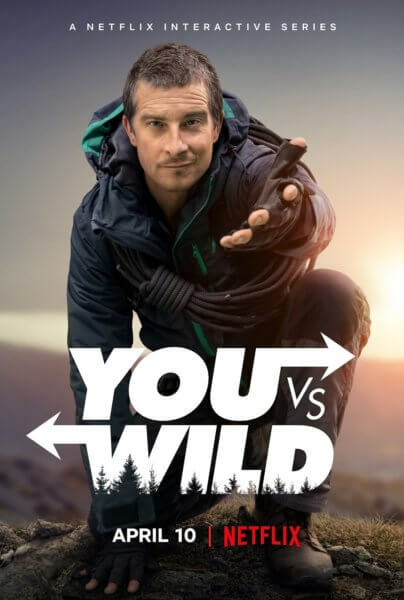 Viewers will decide what direction Bear Grylls heads, whether he crosses streams, swims rivers, climbs mountains, or enters caves in You vs. Wild. The live-action interactive series will debut on Netflix on April 10, 2019. Season one consists of eight episodes and has Bear Grylls, Chris Grant, Drew Buckley, Ben Silverman, Howard Owens, Rob Buchta, and Delbert Shoopman on board as executive producers. Ben Simms directs the first season. “I’m so proud to deliver this first-of-its-kind live-action interactive series, really giving viewers an all access pass to explore the world and its landscapes in my boots. The stakes are high in this one!” said Grylls. “In You vs. Wild, viewers join survival expert Bear Grylls on exciting adventures all over the world. Dense jungles, towering mountains, brutal deserts, and mysterious forests await, with tough decisions around every corner. In this groundbreaking interactive adventure series, you make all the decisions and whether or not Bear succeeds or fails is totally up to you. “Bear Grylls has become known as one of the most recognized faces of survival and outdoor adventure. His journey to this acclaim started on a small island off the U.K. coast, where his late father taught him to climb and sail. Trained from a young age in martial arts, Grylls spent three years as a soldier in the British Special Forces; it was here that he perfected many of the survival skills that his fans all over the world enjoy.